Cream cheese and sugar thoroughly. 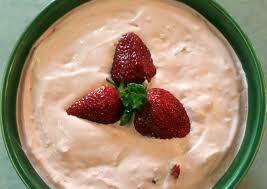 Fold in bananas, pineapple, frozen strawberries and Cool Whip. Freeze in a 9×13 pan or individual cups. (We prefer to freeze in foil cupcake liners in a muffin tin.) Keep frozen until shortly before serving time.